"(GREENSBORO, NC) - The 118th annual Central Carolina Fair will once again light up the sky around the Greensboro Coliseum Complex this fall. Featuring spectacular rides, carnival food and games, musical entertainment and attractions for all ages, the 118th annual edition of the Central Carolina Fair will begin Friday, September 9 and run through Sunday, September 18. 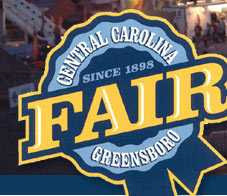 Advance tickets for the Fair will go on sale Monday, August 15 at 11 a.m. at www.ticketmaster.com and the Greensboro Coliseum box office. A special $25 advance ticket offer, available until 4 p.m. on Friday, September 9, includes one Fair admission and one unlimited ride wristband good for any single day of the Fair (a 20% savings off prices at the gate). Fair admission passes (without ride wristband) are also available in advance for $6. Sunday, Sept. 18 12 p.m. – 9 p.m.
and patrons under 42’’ - FREE. After 8 p.m. on each Saturday $26 (includes admission plus unlimited ride wristband)"